Yes, you read the title right. Instead of XSLT transformer, I’m doing a real world transformation this time. SOA 12C has not caught on fire; posting old stuff is getting boring. So I thought I'll pick up a new topic for a change. I bought a Danby chest freezer last year. They are not kidding when they called it a freezer. 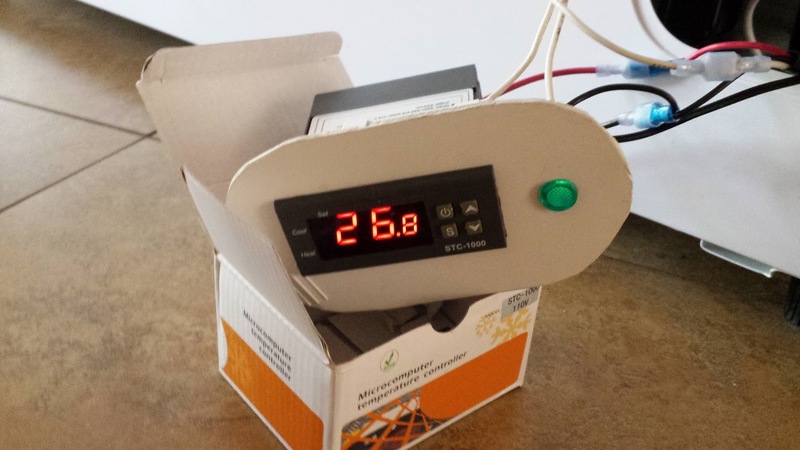 Although it came with a temperature dial, the highest temp you can set is way below freezing. 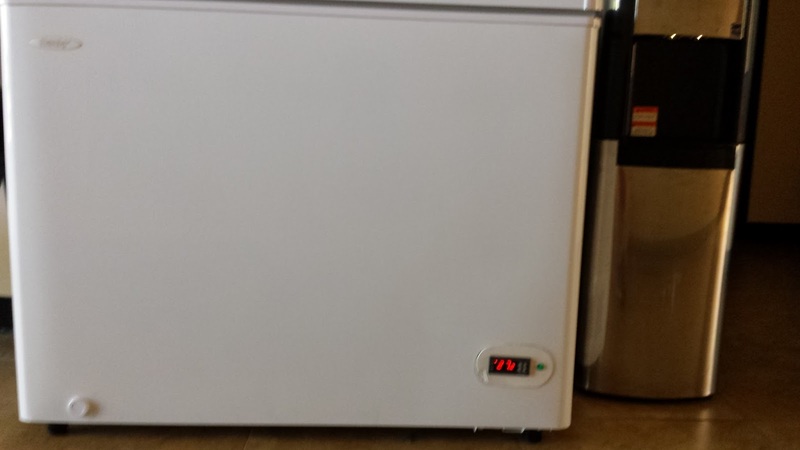 It is puzzling to me why won't they provide a wider temp range so user can operate it either as a freezer or fridge. 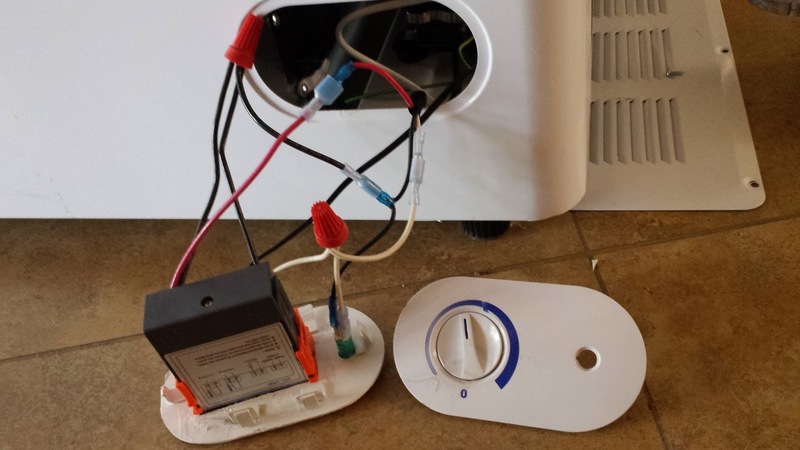 I thought there would be an easy way to rig the temp control somewhere to fool the system. 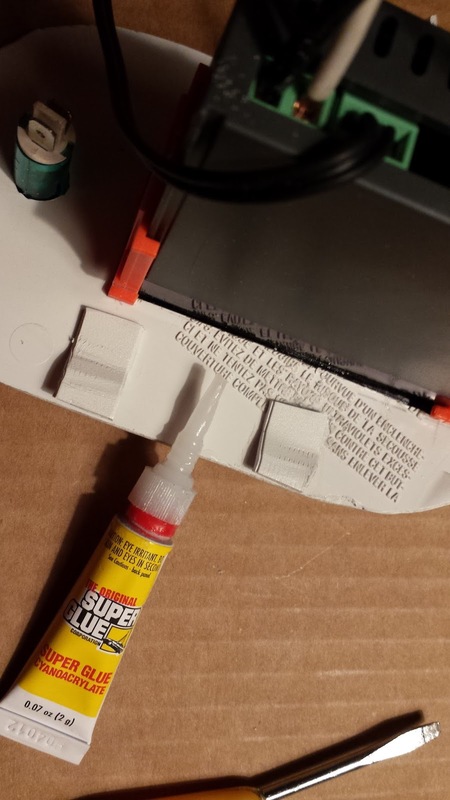 After searching online, I found out there is no easy trick. I decided to bite the bullet and give it a try to replace the controller myself. It was quite an enlightening experience. I stumbled on so many trivial things that pros didn’t bother to mention, after I overcame those problems, I thought I would share it so it may benefit other amateurs like me. How does the existing controller work? The picture on the left shows the original controller. 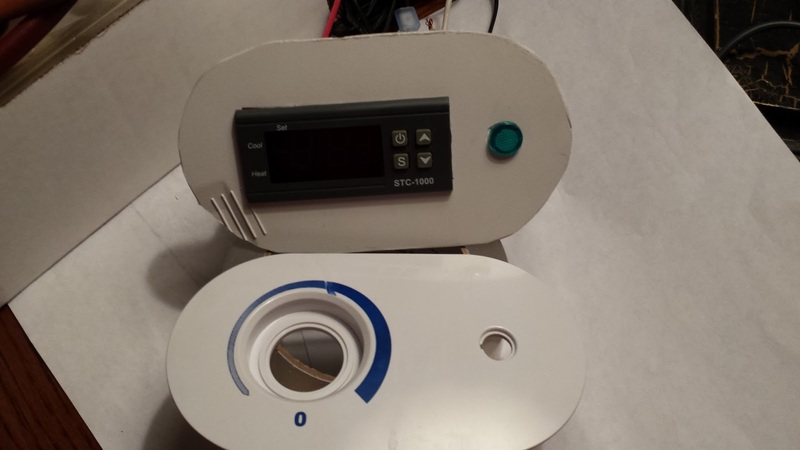 The picture below shows the STC-1000 controller (on the left) next to the original, It's not wired yet. 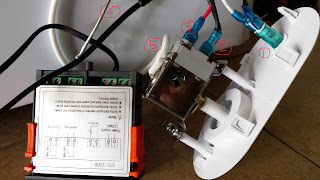 The original sensor came with a metal probe, that metal probe (I circled #4 on the drawing below) is directly linked to the controller with a white insulated line circled #5. The white cover is the temperature insulation, I believe that mechanical temperature sensor relies on that probe to transmit some chemical gas pressure based on the temperature change inside the freezer. That also explains why there is no power supply to the original controller itself. The mechanic controller acts a switch to connect and disconnect the power from the black hot line (circled #2) and red line (circled #3), which delivers the power to the frig. 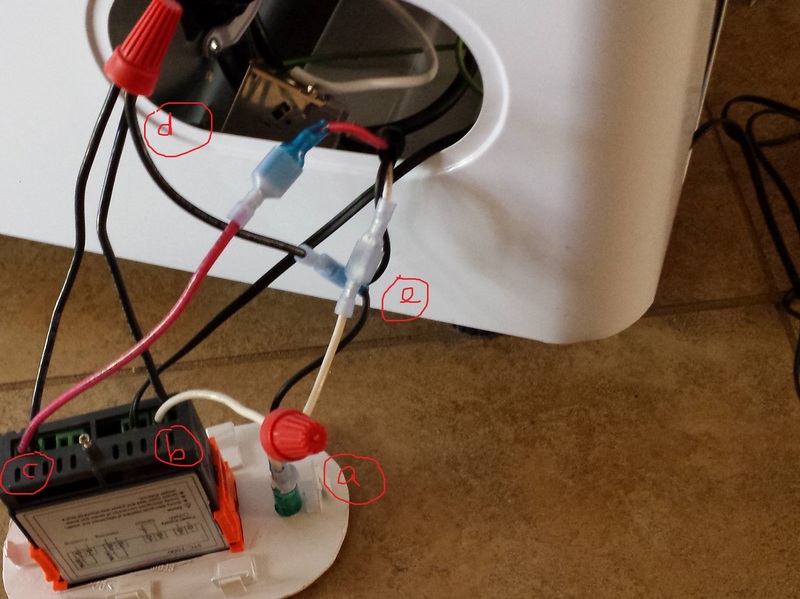 In the picture where I circled #1 is an always on LED light. There are 4 pairs of wire terminals on the back STC 1000. Terminals 3 & 4 are for the sensor that came with the unit. The digital sensor is the black blob on the tip of the wires. The wires are actual signal lines. 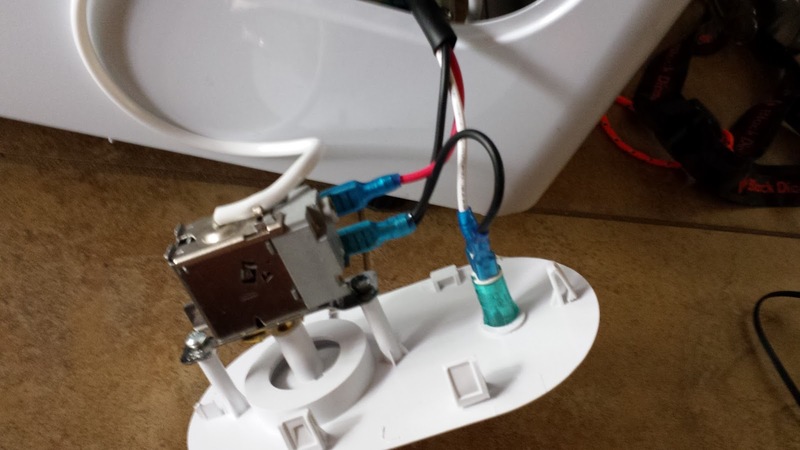 I simply routed the sensor wire from the side of the frig, then tossed the tip inside the frig. 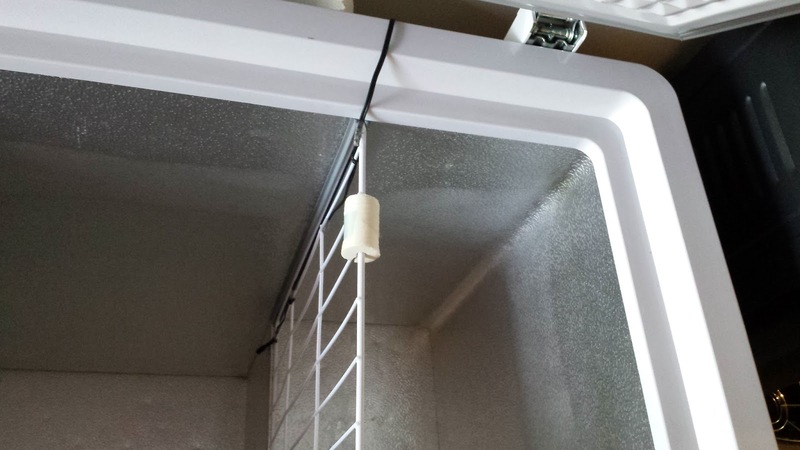 Because the wire is signal wire, it doesn’t matter it’s exposed to the room temperature. I got the original neutral white and original black wire so the indicator has constant power. Circle (b) shows the controller power wiring (they are terminals 1&2 on STC-1000). I got black power line from (d), then the red line goes to the frig unit. 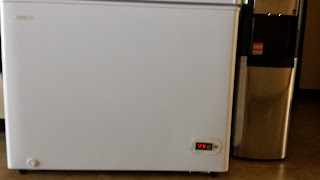 As temperature changes, the switch will connects/disconnects the power to the red line, and therefore control the refrigerator. To configure the digital controller, you'll just need to google STC-1000 user manual. My unit came so cheap, it didn't even include a print out. Please note the STC-1000 comes with power deliverying circuits. One for cooling (terminal 7&8). One for heating (terminals 5&6). Since I only need the cooling, I left the heating terminals unwired. The purpose of both cooling and heating is to control an incubator, which requires constant temperature. When inside tempearture is above the set value, the cooling unit kicks in. (Obviously, I only have cooling unit). When it's below the set temperature, the heating unit will kick in. 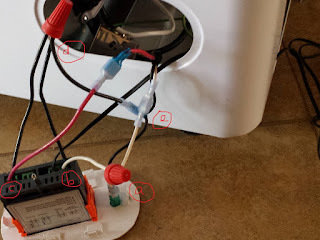 The photos below shows how I made a replacement control panel with a cut out plastic part. The project costed me a whole weekend.